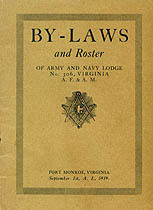 By-Laws and Roster of Army and Navy Lodge, No. 306, Virginia, A. F. & A. M., Fort Monroe, Virginia, September 1st, A. L. 5919. Organized under Dispensation, April 2, 1909. Chartered, February 10, 1910. Constituted and Consecrated, March 11, 1910. Names in this online transcription include Abbott, Alfred, Allen, Anderson, Andruss, Anthony, Armstrong, Asmann, Bailey, Barnes, Batkins, Baulch, Beard, Beggs, Bell, Bergstrom, Bethea, Betry, Bettein, Bierman, Bockhous, Brandt, Brown, Bunker, Burger, Burgess, Byrd, Callan, Campbell, Canefsky, Carpenter, Carr, Carter, Case, Chapman, Christie, Confer, Connor, Conrath, Cooper, Cornell, Courtney, Coward, Coy, Craigs, Crawford, Crissy, Cross, Dailey, Danker, Dennis, Dorn, Dresser, Drummond, Eckholm, Eddy, Ehrman, Ellis, Emig, Erickson, Eubank, Evans, Farner, Faville, Fender, Finley, Fisher, Fleming, Forth, Fosdick, Fowee, Franzblau, Frost, Gardos, Garrigan, Gay, Geisler, Gibson, Gifford, Gilbert, Gilchrist, Gosselin, Gowing, Gray, Groh, Grundler, Guthrie, Hagemeister, Hahn, Hall, Harmon, Harrell, Harrod, Havighorst, Hawes, Hawkins, Heatherly, Hedge, Heinrich, Hicks, Hill, Hilliard, Hime, Hinson, Hitch, Hoge, Horne, Horstmann, Hubbard, Hutcheson, Johnson, Kaatz, Karling, Kauderer, Kline, Knight, Koehl, Koenig, Krummen, Krupp, Ladd, Lambie, Laughlin, Lawrance, Lehr, Lemaster, Lockhart, Machle, Mack, Manuel, Marsden, Martini, Mathews, Mayer, Maynard, McCammon, McClure, McGinnis, McKay, Mead, Meeker, Meister, Merryman, Meyer, Miller, Mills, Minor, Mitchell, Moore, Morris, Murray, Newman, Nugent, O'Hara, Oldham, Parish, Parker, Pea, Peabody, Pendleton, Phillips, Pool, Povelite, Pruefert, Radcliffe, Rhoads, Ridener, Riggs, Roberts, Rorke, Rowe, Rubenstein, Ruhlen, Runnion, Salsman, Saunders, Schlapp, Schlatter, Scott, Sessamen, Shank, Sharman, Sharp, Shell, Shippam, Siden, Sigler, Simons, Slagle, Sleeper, Smith, Smithley, Snider, Souder, Stone, Sverdlik, Swan, Tarpley, Taylor, Tobin, Todd, Townsend, Tredway, Trott, Tuch, Turner, Tuttle, Twaddell, Vaterlaus, Vaughan, Vaughn, Vellines, Vitt, Wald, Walker, Walton, Webb, Wellar, Wesley, Whaley, White, Whitman, Wildrick, Wilson, Worcester, Worfred, Worley, Wright, Yassell. The Genealogy Today catalog number for this item is 10354. When inquiring about the information in this resource, please mention the catalog number.